For those of you who can’t wait, you can now read an excerpt (warning: it’s a little grotesque) on the book’s website (courtesy of Gnoe’s wonderful book and obento blog Graasland.) Enjoy! ‘ve just ordered “Cloud Alas”(- together with “Mosquito” which was waiting in my amazon shopping cart). looking forward to it, cos its going to be a new style of writing to me. and, A Thousand Autumns – intriguing. the beginning reminded me of Baricco’s “Silk”, but i guess its going to develop in a very different way. i’ve never read anything by Mitchell, and what is his connection with Japan? 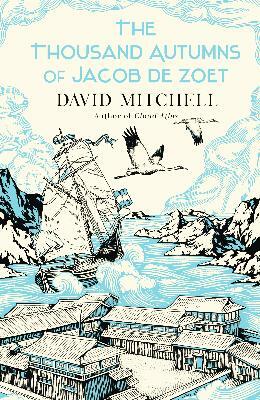 David Mitchell taught English in Japan for eight years and is married to a Japanese lady. His first book Ghostwritten, which is a series of interlinked stories had a couple set in Japan and his second book Number9Dream is set in a futuristic Tokyo. His writing style is different in each book which I find very refreshing and stimulating. He’s not afraid of trying something new which is very admirable. As you can probably tell, I’m a big fan! Let me know your thoughts on the books once you’ve read them! I haven’t read ‘Silk’ although I know there’s been a movie made of the book.